Conflict minerals1 originating from the Democratic Republic of the Congo (DRC) are sometimes mined and sold by armed groups to “finance conflict characterized by extreme levels of violence”2. Some of these minerals and the metals created from them (such as tantalum, tin, tungsten, and gold) can make their way into the supply chains of the products used around ...the world, including those in the electronics industry. Intel’s suppliers acquire and use minerals from multiple sources worldwide. As part of Intel’s commitment to corporate responsibility and respecting human rights in our own operations and in our global supply chain, it is Intel’s goal to seek to use conflict-free tantalum, tin, tungsten, and gold in our products while continuing to support responsible in-region mineral sourcing from the DRC and adjoining countries. 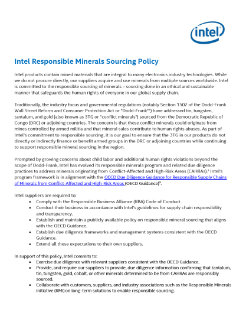 Intel expects our suppliers to have in place policies and due diligence measures that will enable us to reasonably assure that products and components supplied to us containing conflict minerals are DRC conflict-free3. Intel expects our suppliers to comply with the Electronic Industry Citizenship Coalition (EICC) Code of Conduct and conduct their business in alignment with Intel’s supply chain responsibility expectations. Read the full Conflict-Free Sourcing Policy in the Democratic Republic of Congo.